Carson City is the capital of Nevada and offers an Old West feel. Located about 40 minutes from South Lake Tahoe and an hour from North Lake Tahoe it can be easily accessed from either Shore. Also located nearby is the historic Old West Town of Nevada City. Carson City has a large selection of Golf Courses that meet every budget and ability. If you are a golfer and have not played some of the Carson City Courses you should definitely work it in to your next trip to Lake Tahoe. The Surrounding Areas of Lake Tahoe and Truckee offer an abundance of options. Whether it's the nightlife, gambling, and entertainment offered in Reno Nevada or the peaceful mountain setting of the Plumas / Sierra county don't miss out on seeing all the Lake Tahoe Area has to offer. 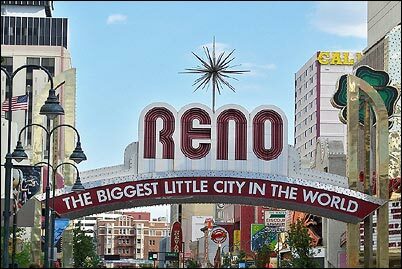 Reno Nevada has always associated itself with the beautiful Lake Tahoe area. Anyone flying into the area will most likely come through the Reno International Airport. Located only 45 minutes to an hour away from Lake Tahoe, there are a large assortment of lodging options ranging from budget ski packages along with other great activities. There are also many upscale accommodations as well. Reno offers some of the glamour of Las Vegas on a smaller scale, but then you can throw in the fantastic outdoor activity that you can only get in the Sierras and Lake Tahoe. Plumas and Sierra Counties are located about 45 minutes North of Truckee. This area consists of several small communities nestled into the picturesque Sierra Nevada Mountain Range. It offers beautiful hikes, fishing, and of course golf. This is becoming a large golfing community with courses like Whitehawk Ranch and Plumas Pines. It's worth the trip. If you are looking for that peaceful "Cabin in the Woods", this is your place. No web pages matching ALL of your search terms were found. Please modify your search, and try again.